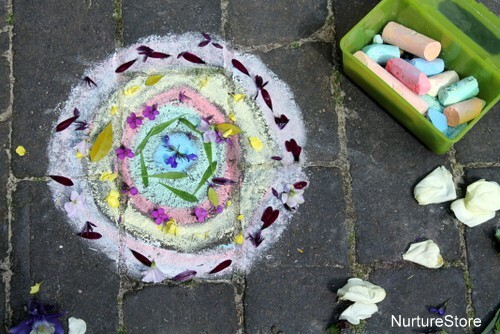 This idea for nature mandalas for kids takes its inspiration from the spring flowers that are opening in our Garden Classroom this month. We have some beautiful flowers peeping out in our Garden Classroom this spring, and I’ve been encouraging the children to stop to take a closer look at them when we’re playing outdoors. 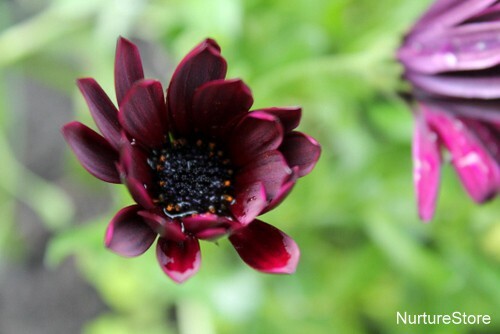 These osteospermum have such a deep, rich colour, and they’re just opening out now to reveal the very dark circles in their centre. 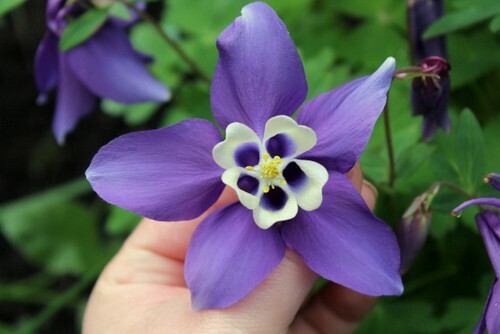 These aquilegia – which you might know as columbines or granny’s bonnets – are so pretty too, with delicate, nodding heads. They’re very different to the osteospermum, but still have that concentric circular shape, just like a mandala – which is where our outdoor art idea came from. A mandala is a circular symbol, often seen in Hinduism and Buddhism, which represents the universe. It can be used as a focus for meditation, and making one is very calming and centring too. 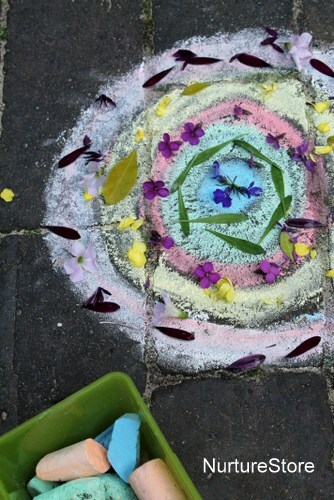 We already had our chalks out from our colour matching game, so we decided to combine them with some flowers to make a natural mandala. 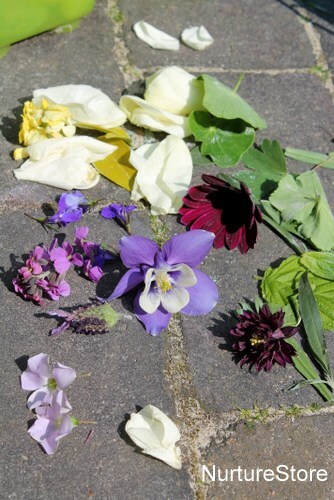 We took a selection of flowers and leaves from the garden, choosing the ones we thought were pretty and which had an interesting mix of petals and leaf shapes. And then we talked about all the different shades we’d found, and looked to see if we had the right chalk colours to match up. 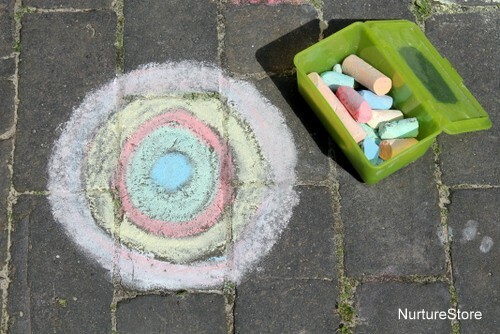 We used our chalks to draw out a simple mandala wheel. We found that we could mix up different shades by using two or three colours of chalk over the top of each other, blending them together using our fingers. And once we’d made our outline, we began to fill in the mandala with our petals and leaves. Creating the mandala is a lovely peaceful activity. You need to be quite gentle with the petals as you pull them off the flowers, and be mindful to place them carefully on your chalk circles. It’s so uplifting to create art using natural materials, right in the heart of the garden. The sun was shining, the bees were buzzing and it was very relaxing to work together as a small group to create our design. You can make your design as simple or as complex as you like, matching your colours or contrasting them, and making both random and repeating patterns. 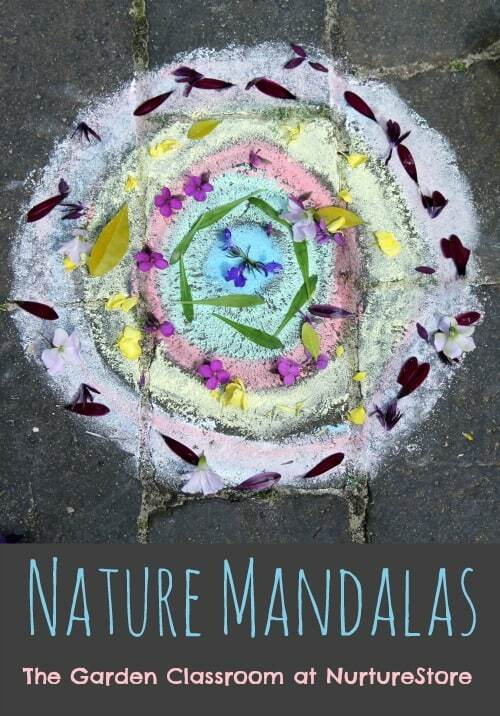 And once you’ve made one, you might be inspired to make mandalas using other materials too. 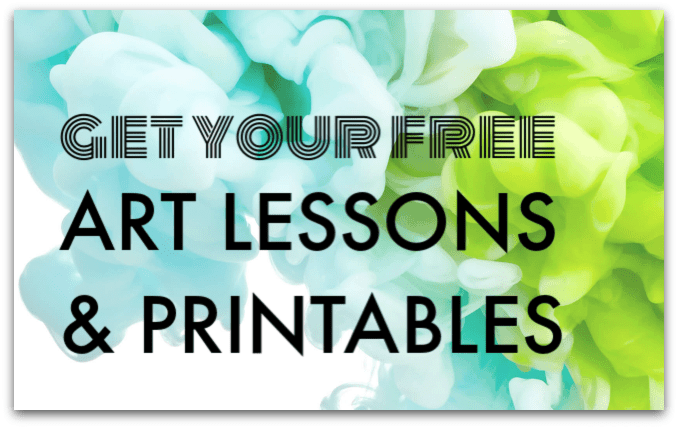 You could try painting on tin foil, make a watercolour mandala, or even a playdough mandala. I love love love these mandalas. We just did nature inspired mandalas on wood. I LOVE the idea of using chalk as part of them. Oh my goodness. So beautiful! Did you blog your wooden ones Meri? I want to see them! So pretty! I’m going to have to do this with my girls sometime soon! It’s so great natural activity for my kids for outdoor play. I love it. We can also try with coloured sand to make mandalas. I will try it soon.